Annapurna is a series of peaks in the Himalayas, a 55km (34mi)-long massif of which the highest point, Annapurna I, stands at 8,091metres (26,545ft), making it the 10th-highest summit in the world and one of the 14 "eight-thousanders". It is located east of a great gorge ( 2835'18?N 8349'11?E ) cut through the Himalayas by the Kali Gandaki River, which separates it from the Dhaulagiri massif. (Dhaulagiri I lies 34 km/21mi west of Annapurna I.) Annapur?a is a Sanskrit name which literally means "full of food" (feminine form), but is normally translated as Goddess of the Harvests . In Hinduism, Annapurna is a goddess of fertility and agriculture and an avatar of Durga. The entire massif and surrounding area are protected within the 7,629 sq. km Annapurna Conservation Area Project (ACAP), the first and largest conservation area in Nepal, established in 1986 by the King Mahendra Trust for Nature Conservation. The Annapurna Conservation Area is home to several world-class treks, including the Annapurna Circuit. The Annapurna peaks are among the world's most dangerous mountains to climb, with a fatality rate of 40%. Annapurna I was the first 8,000-metre (26,200ft) peak to be climbed. Maurice Herzog and Louis Lachenal, of a French expedition (including Lionel Terray, Gaston Rbuffat, Marcel Ichac, Jean Couzy, Marcel Schatz , Jacques Oudot , Francis de Noyelle ), reached the summit on 3 June 1950. (See the documentary of the expedition "Victoire sur l'Annapurna" by Marcel Ichac). Its summit was the highest summit attained on Earth for three years, until the first successful ascent of Mount Everest. (However higher non-summit pointsat least 8,500metres (27,900ft)had already been attained on Everest in the 1920s.) The south face of Annapurna was first climbed in 1970 by Don Whillans and Dougal Haston , members of a British expedition led by Chris Bonington which included the alpinist Ian Clough, who was killed by a falling ice-pillar during the descent. They were, however, beaten to the second ascent of Annapurna by a matter of days by a British Army expedition led by Henry Day. 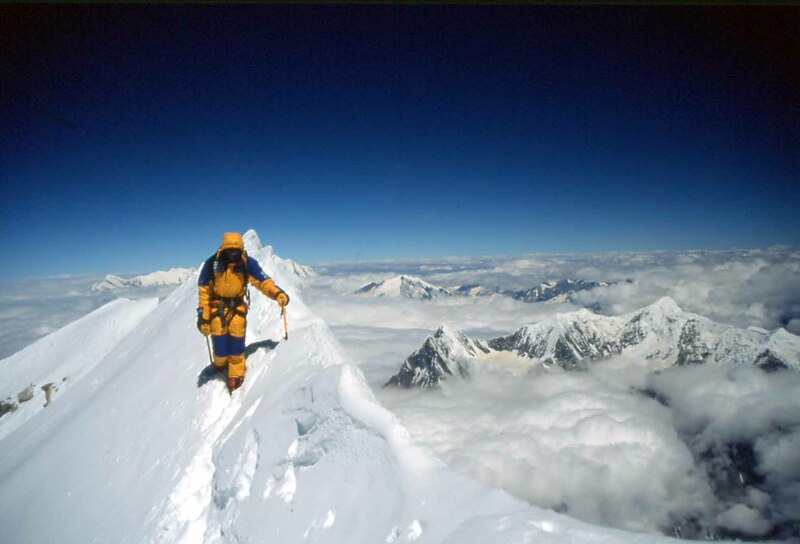 On 3 February 1987, Polish climbers Jerzy Kukuczka and Artur Hajzer made the first winter ascent of Annapurna I. The first solo climb was October 2007 on the South Face by Slovenian climber Tomaz Humar. Annapurna II, the eastern anchor of the range, was first climbed in 1960 by a British/Indian/Nepalese team led by Jimmy Roberts, via the West Ridge, approached from the north. The summit party comprised Richard Grant, Chris Bonington, and Sherpa Ang Nyima. In terms of elevation, isolation (distance to a higher summit, namely Annapurna I, 30.5km/19.0mi) and prominence (2,437m/8,000ft), Annapurna II does not rank far behind Annapurna I. It is a fully independent peak, despite the close association with Annapurna I which its name seems to imply. Annapurna III was first climbed in 1961 by an Indian expedition led by Capt.Mohan Singh Kohli, via the Northeast Face. The summit party comprised Mohan Kohli , Sonam Gyatso, and Sonam Girmi. Annapurna IV, near Annapurna II, was first climbed in 1955 by a German expedition led by Heinz Steinmetz, via the North Face and Northwest Ridge. The summit party comprised Steinmetz, Harald Biller, and Jrgen Wellenkamp. Gangapurna was first climbed in 1965 by a German expedition led by Gnther Hauser, via the East Ridge. The summit party comprised 11 members of the expedition. Annapurna South (also known as Annapurna Dakshin, or Moditse) was first climbed in 1964 by a Japanese expedition, via the North Ridge. The summit party comprised S. Uyeo and Mingma Tsering. Hiunchuli (6,441 m/21,126 ft) is a satellite peak extending east from Annapurna South, Hiunchuli was first climbed in 1971 by an expedition led by U.S. Peace Corps Volunteer Craig Anderson. Machapuchare (6,993m/22,943ft) is another important peak of the Annapurna Himal, though it just misses the 7,000 metre mark. Machapuchare and Hiunchuli are prominently visible from the valley of Pokhara. These peaks are the "gates" to the Annapurna Sanctuary leading to the immense south face of Annapurna I. Insurance for Nepalese expedition crew.